Imagine an electrical appliance. You decide to use it, and plug it in. Nothing happens. It doesn’t work. What do you do? Check the electrical circuits right? Because now you know something’s wrong. Just like an electrical appliance, the human body also has energy circuits called meridians flowing throughout the body and even externally in one’s aura (known as the Auric Field). These circuits or meridians can influence emotional and mental wellbeing and hence it’s critical to keep the energy flowing freely through them, without any disruptions. It is these energy meridians flowing throughout our body that can make us feel energised if flowing freely or low in energy if they become blocked. By tapping on these energy meridians using Emotional Freedom Techniques (EFT) you can also harness the power of the body and mind to live the life you want, achieve your goals, enable peace of mind and health. EFT Tapping has the ability to get to the root cause of an issue and heal it permanently. Learn experiences of others who have learnt EFT. While reviving this energy at times may seem time consuming, once you learn EFT just 5 minutes a day can bring back the zest in your life. Over the years stress, accumulated emotions, sedentary lifestyle and many other factors leave you depleted of this energy, and even sometimes disrupts the flow, leading to disease and emotional issues. If there have been times when you have felt exhausted, even though you’ve just woken up or are unable to perform any tasks effectively, or even have a lack of interest in overall life, chances are your energy flow has been disrupted and hence, you are unable to function at your highest potential. There may be times when, while clearing energy disruptions emotions may rise to the surface. It is important to remember that these emotions come up so that they could be released, and these can be easily eliminated by simply using the EFT Tapping sequence. To know what this sequence is, download a Free Booklet here. Meditation is also a process which can enable the energy fields within and outside the body to become in balance, hence creating harmony and inner peace. To get started straight-away below you will find 3 daily energy exercises which you can practice right now. They are easy to follow and will allow the energy in your meridians to flow freely, allow negativity to be released and leave you feeling refreshed and energised. This is one of my favorite tapping sequences, not just because it instantly revives my energy but because I feel like a child again. As the name suggests one of the main benefits to this is to calm down anger, tantrums or even an emotional overwhelm. Begin by tapping the point just below your collar bone on your sore spot with your fists closed. Tap your feet at the same time, just like you would while throwing a tantrum. You could even shout out loud if you like. Thymus Tapping is very effective if you have a respiratory disorder like a cough or a cold as it boosts your immune system. Begin by locating your thymus, just in the center of your chest, again this spot will feel a little sore if you press it. Now tap on this point for a few minutes while breathing in through your nose and breathing out through your mouth. Cross crawl harmonizes the left and right side of the body allowing energy to flow freely in both directions. If you have found a soft spot that feels raw/ slightly painful to the touch, you have found your first tapping point. Tap on this point for 15- 20 seconds. Lift your right arm and left leg at the same time. Continue this exaggerated marching for at least a minute swinging opposite arm and leg across the mid section of the body. Breathe in deeply from your nose and breathe out through your mouth. 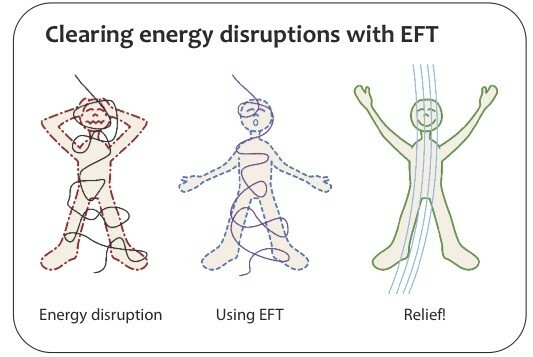 In closing, while there may be many reasons for energy disruptions, it is really important to eliminate energy disruption from the root of the issue with techniques like EFT. You can get started straight-away by practicing the 3 simple exercises of Tantrum Tapping, Thymus Tapping and Cross Crawl to boost you energy, wellness and vitality. So what are you waiting for? You can get started now. P.S. – You might even like this video using EFT Tapping to boost energy levels and feel at peace and calm. Energy Medicine, Donna Eden, September 2008, Publisher Tarcher Jeremy. The next EFT Trainings are in Delhi, Mumbai, Pune and Bangalore.